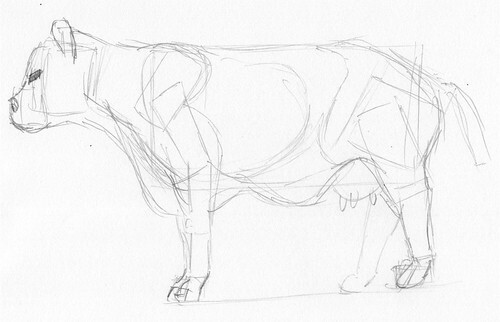 Using a tutorial from Jack Hamm’s book “How To Draw Animals” I sketch a simplified cow in side view. ⇧ In “How To Draw Animals” by Jack Hamm, he teaches us to draw animals in side view with a bunch of rectangles. It isn’t about the rectangles, but about having a way to see the structure of the animal, of all four legged animals, and apply that knowledge to a specific animal. That way you don’t have to guess so much and can spend more time on drawing. After all, the more you draw, the better you will get, especially if you pay attention to how you draw. ⇧ Here I’ve used a photo of a cow and applied the rectangles to it, before dealing with the exact shape of the animal. Getting the parts in the correct positions and at the right size is always a problem when you’re not familiar with a subject. 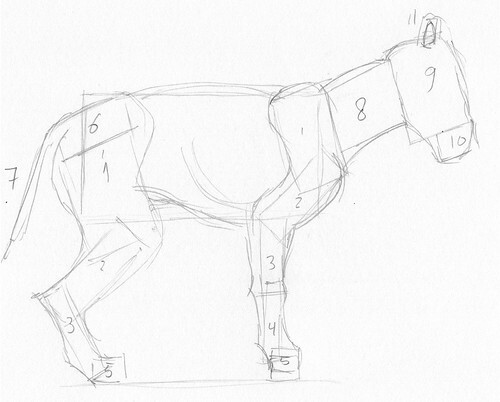 Having a method to roughly estimate the structure of an animal is a handy trick to have in your bag of artist’s tricks. 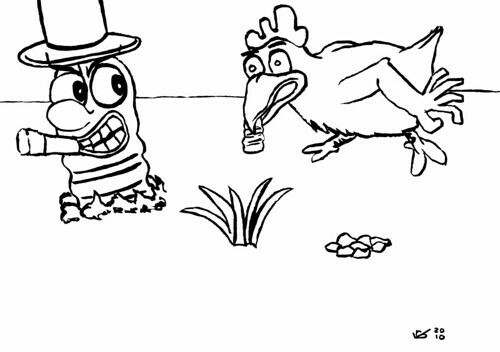 This drawing was recorded as a video on my iPod Touch and uploaded to my Shorties Ustream channel. I did another daily recording of my warm-up sketch, this time on my Livestream channel Draw, draw, draw! (Ustream was unavailable when I wanted to record). Yesterday’s cartoon sketch, which I blue-lined on the computer, was inked and (while recording) dropped on the floor by accident. Still, I finished the inking, while smudging the already smudged drawing even further, because, even after 15 minutes the ink from the Pentel Color Brush pen wasn’t dry. I did another daily recording of my warm-up sketch on my Ustream channel Draw, draw, draw! This cartoon drawing came out of my imagination. Tomorrow I will ink it, also live on Ustream. Third attempt at getting this pose of a kitten right. I took it slow and considerate, but still got it wrong. Ah well, there’s always a next time, and practice makes perfect. 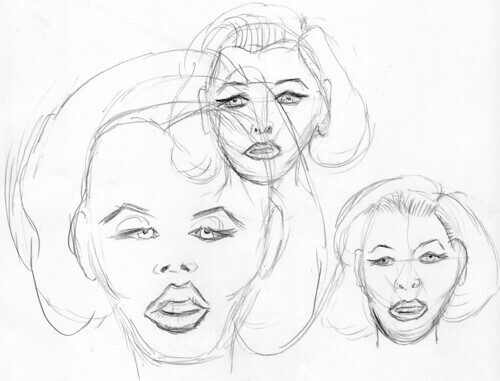 This portrait of generic woman in front viewing perspective is based on a tutorial by John Buscema in “How to Draw Comics the Marvel Way”. The drawing looks a bit stiff and impersonal, because I didn’t take out the helper lines, nor did I use a reference photo for the personal details. After having done the tutorial by John Buscema, I decided to use a photo from the Internet of Google celebrity Marissa Mayer for the personal touches. 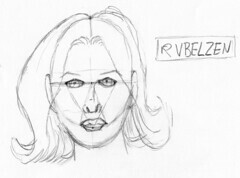 The face can be constructed up to a point, but after that you should fill in the details based on a reference or a person in front of you, so it has personality. My guess is that it’s best to keep it loose. 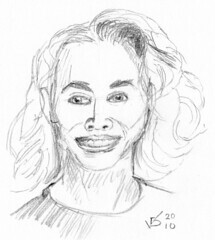 The goal shouldn’t be likeness, but getting a feel for drawing a portrait of a woman. For the second portrait of a woman in front viewing perspective, I gave it finishing touches by using a 3/4 view reference photo of Marilyn Monroe. 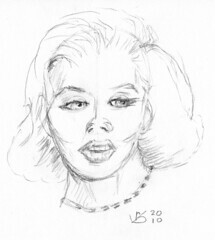 The issue wasn’t to have a drawing of Miss Monroe, but rather have a nice rough sketch of a woman’s portrait. As I see it, the underlying structure of the face is very much the same for all humans. It’s the finer details that let’s us distinguish between individuals. By getting the generic structure in first, putting in the details is less difficult and a somewhat rewarding sketch of a famous person can be done, even if you don’t yet have mad skills to blow people’s socks off. I think it’s all about having fun and being proud of what you’ve accomplished using what skills you have, and perhaps feel motivated enough to get some more by practicing like a crazy person, day in, day out. If it isn’t fun, there’s no way you’re going to get through that phase of getting good enough to impress other people with your drawing skills. If it always feels like “work”, you are going to give up, like so many grown-up have done at some point in their “drawing career” as a young child. 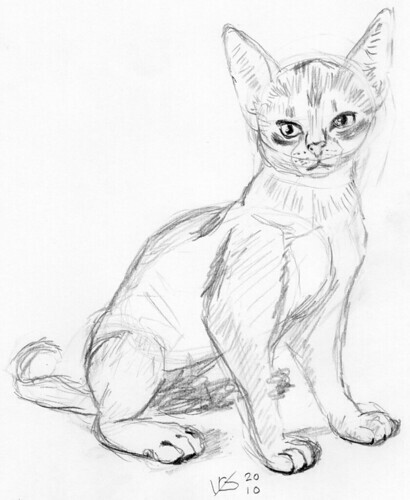 This is my second attempt of drawing an Abyssinian cat called Denise van Outhuizen as a kitten. The is better than what I had yesterday, but still very different from the photo. In my weekly hour long show on Saturday (23:00 CEST) I decided to draw Marilyn Monroe. I had practiced how to sketch her earlier today, and did some of the tutorials in “How to Draw Comics the Marvel Way” by John Buscema, where he covered how to draw beautiful women. This is one worthy for a rematch next Saturday. 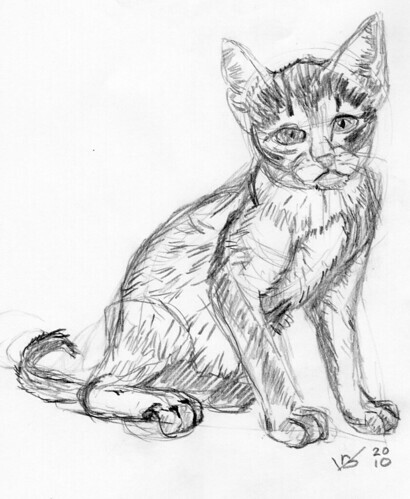 This sketch is more or less the same pose as the reference photo, but completely constructed from basic shapes (no tracing was used). This is a huge improvement over what I did earlier today. After I did the formal 3/4 perspective view, I tried a front view, using a simpler drawing style. Not sure what I was doing, I got these results, which aren’t bad, just not as refined as what I did earlier.